This Is Only Supported in Mozilla Firefox and Internet Explorer Version 8 Above. 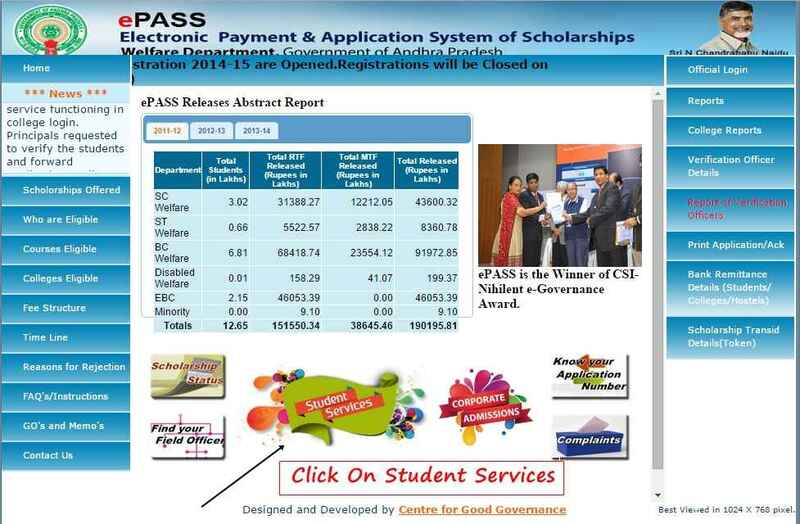 AP and Telangana Epass Scholarship Application released and Last Date Also Released. it is For 2014-2015 Academic Year. Andhra Pradesh Govt. is providing financial assistance to students who belong to economically backward section. The reservation candidates belongs to SC/ST/BC categories with lower income levels are eligible to claim e-pass scholarship. The students who are perusing their undergraduate courses in state of AP are eligible to get the scholarship from AP Govt. The eligible students to get e-pass Scholarship can apply online through, www.apepass.cgg.gov.in. AP Govt. has announced scholarship notification for students for the year 2014-2015. The candidates who are eligible to claim scholarship have been already applied through online within the specified dates announced by the AP Govt. 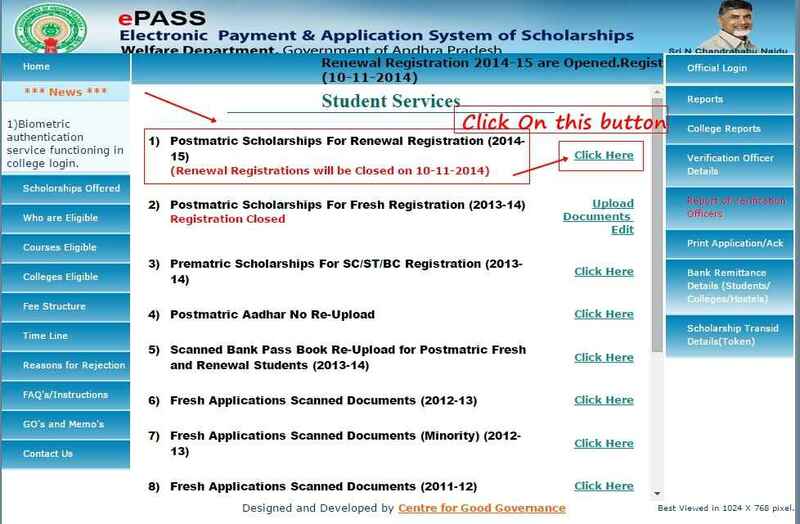 Now students can get updated with their e-pass scholarship status 2014 on the Official Website of AP Govt. , www.apepass.cgg.gov.in. For Applying The Epass Scholarship Renewal Registration we need some documents for further verifications.its for all the castes those who are poor. So many Students are not aware of Epass Scholarship Renewal Registration.it is very careful while applying because without having careful you application must not approve. so for the students sake we are showing step by step process. 1) a) All the Students Registering on the epass website must have a Aadhar card of . b)If you do not have Aadhar Card, go to the nearest Aadhar Enrollment centre for Enrollment . 2) Incase of change of Bank account, open your Zero balance account in any of the nationlized banks (Click here for the list of nationalised banks). Bank account not required For EBC students. 3)Student should have a Mobile Number for receiving One Time Password for registration (Mobile number may belong to the student or any one of his/her family members). 4) Study/Bonafide Certificates for the last 7 consecutive years of study, for the students who are Native of Andhra Pradesh, Studying in Telangana and the students who are native of Telangana, studying in Andhra Pradesh, for confirmation of local status in the state of Andhra Pradesh. 5) Nativity Certificate issued after 02-06-2014 by the Tahsildar through meeseva by the students belonging to EBC / OC-Minorities / OC-Physically challenged categories. 6) Furnish PAN Card No. of the student and also father and mother of the student, if available. 7) Furnish Four Wheeler Vehicle Registration No. of the student and also father and mother of the student, if available. Study/Bonafide Certificates for the last 7 consecutive years of study. (For the students as refered at point no. 4 above). 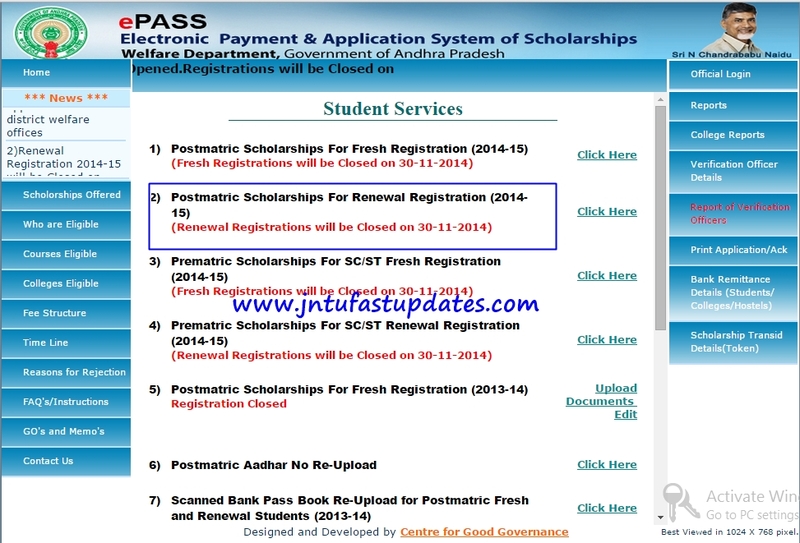 E-Pass Renewal Complete Guide providing By JNTU Fast Updates. After separation of thelangana I ironed to renewal my inter scholarship ..2014-2015 year.now I am studying degree 1 st year. 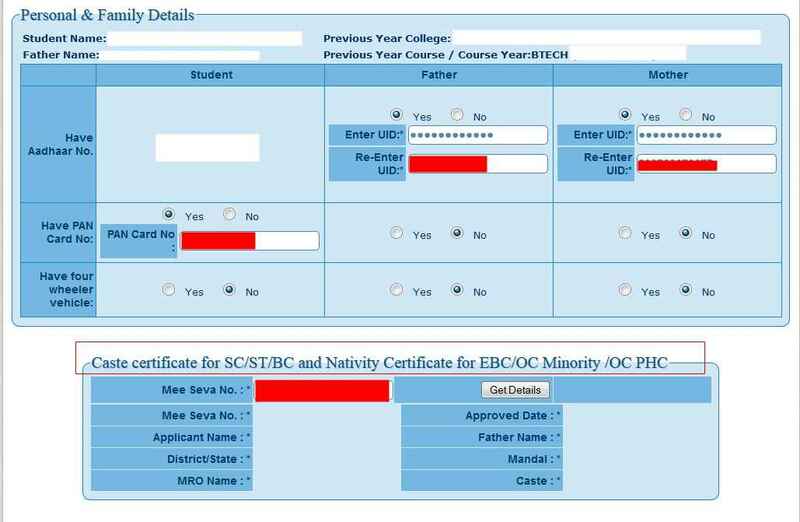 In my scholarship status form I didn’t see inter second year details..so what can I do to renewal it now..is there any chance to Renewal it now..plz give me response..